This is one of my work spaces. It doubles as the dining room table. 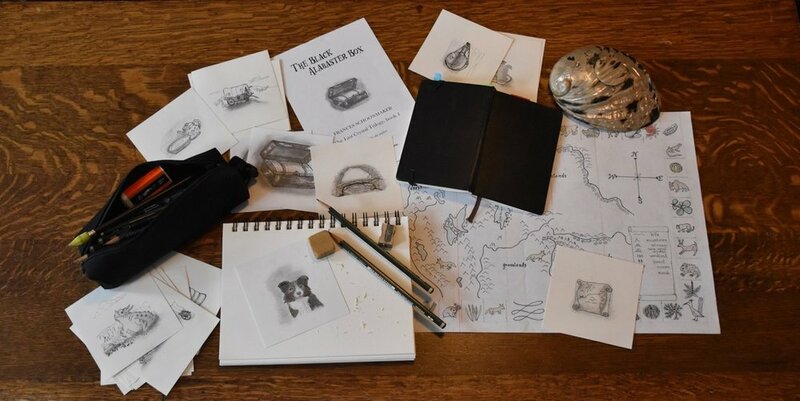 The project you see was creating illustrations for chapter headings in The Black Alabaster Box. I have a desk upstairs. But there is something inviting about sitting at the dining room table. Maybe because it is close to the tea kettle? The Last Crystal Trilogy spans a period of 100 years. It begins on the Santa Fe Trail in the late 1850s. I've always loved the history of things and reading books that create imaginative worlds. In the Trilogy, there is room for fact and fancy. The Trilogy started backward. We were visiting family in Sacramento when I learned that my Uncle-in-Law, Frank, had made a train trip every summer to visit grandparents. His father worked for the railroad. So he and his little brother were put on the train to travel from Missouri to California alone. All sorts of possibilities came to mind. Book 3, written first, begins on the Santa Fe Chief Train during World War II. Book 1, The Black Alabaster Box begins on the Santa Fe Trail in 1856. The Red Abalone Shell takes place in between—during World War I. Books 1 and 2 are now available as an ebook, paperback & hardback through Amazon, Barnes & Noble, Indie Bound, the iTunes iBooks app, and your local bookstore upon request. They are available globally through Book Depository. The cover for each of the books in the Trilogy is the work of Liesl Bolin. There is a story behind each cover. Here one of many photographs taken by Liesl as she prepared the final copy. The setting is in a park in Lawrence, Kansas not far from the Santa Fe Trail. After taking many, many pictures it was clear that not one was a really great picture of all three characters who were to appear on the cover. Mona, the dog who posed as Old Shep had been playing and thought more play would be a whole lot more fun than posing. In the end, Liesl chose a picture of “Grace” and “Mr. Nichols” and put a picture of Old Shep on the back along with a larger picture of Grace. You will know why Grace is dressed as a boy if you’ve read the book. Models for the cover were my granddaughter, Amelia, and my brother, Warren Schoonmaker. They both made invaluable contributions to the project in many ways. Amelia read and re-read versions of each of the books and gave good, solid advice along the way. Warren’s extensive knowledge of people and the history and geography of the West enriched the story. I also had several writing retreats at his house, getting away from my day to day routines. In fact, it was at his round oak kitchen table that Ruby and Junior first appeared. He had gone to have lunch with a friend and I was pondering how to get some comic relief into a very intense book. Lots of difficult, challenging things happen in The Black Alabaster Box. All of a sudden, there were Ruby and Junior in my head, the twins you love to hate. I laughed out loud. Cover Copy: It had been quiet along the Santa Fe Trail for more than a year when the Stokes Company set out for California in the early 1840s, the Willis family among them. A reluctant traveler, twelve-year-old Grace Willis longs for her fortunate, safe and comfortable life at home. Just as she is learning to negotiate life on the trail, Grace is kidnapped by fellow travellers and taken into Oklahoma Territory. She must decide if she will cave in to despair or muster the courage to run away and search for her parents. Grace finds help in unlikely places. She discovers that there really is such a thing as magic and there are some things only a child can do. Liesl came up with several designs for Book 2. But this is the one that kids we ran it past liked the most. Amelia summarized it very well, “It captures a pivotal moment in the book and it raises questions about what is happening.” How come the boy is wearing an Indian blanket? Has he been for a swim? Who is he? I’ll give that last bit away. He is James Matthias and he has been in the water. But you’ll have to read the book to find out why! Below you can see some of the steps in creating the cover. At first we thought it would be nice to have Mr. Nichols and James on the steps of the church where he is found in scene one of the book. Liesl did a great deal of research before finding a church in the country that was built in the late 1800s. But none of the pictures were at all interesting and the light wasn’t right. But ice cream following the photo shoot was very interesting and satisfying. Our friend Nathaniel was a real trooper. He gave up a Saturday morning for another round of picture taking.